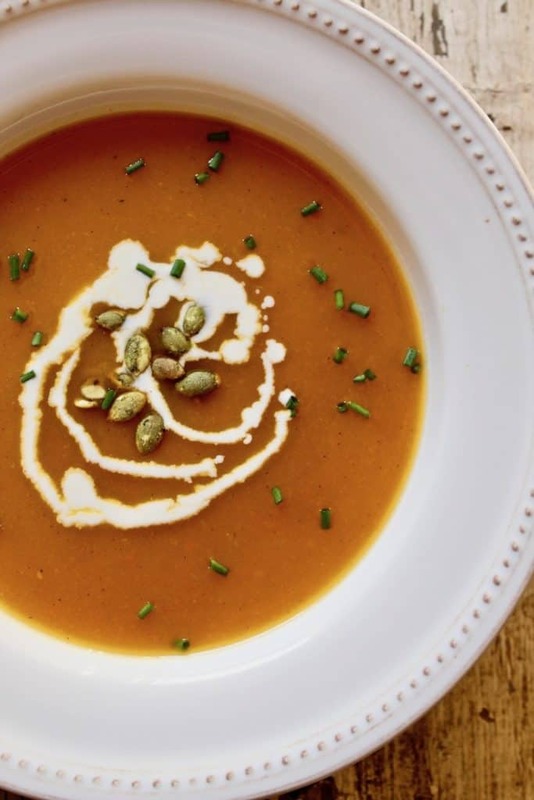 Pretty fancy name for, well, squash soup. Doesn’t Autumn Squash Purée sound so much more appetizing? I know my kids, and winter squash anything is not gonna fly with them. 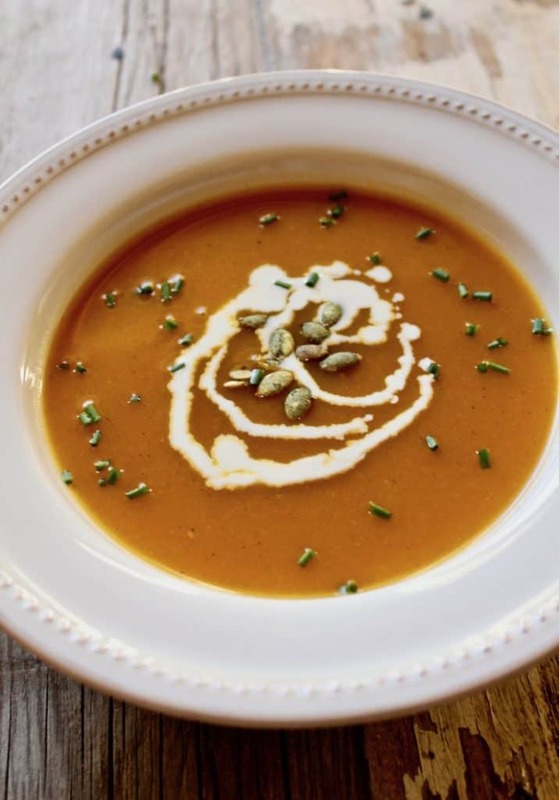 But I keep making this roasted butternut squash soup anyway because it’s fall, the market is filled with locally grown squash, and I like this soup. It’s just perfect this time of year. My parents gave me The New Basics Cookbook for Christmas shortly after I was married. I’ve made many things from this cookbook as well as The Silver Palate Cookbook. Both cookbooks have dog-eared pages and show the telltale signs of use, they are two of my favorites. 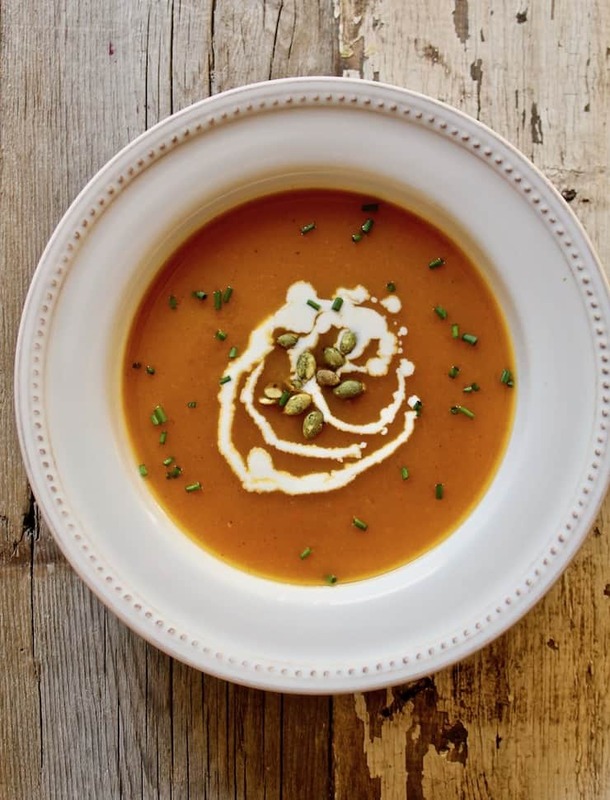 This winter squash soup comes from The New Basics Cookbook by Julee Russo and Sheila Lukins. It is essentially a purée, winter squash and vegetables that are baked and then put through a food mill. That’s how I do it. Their recipe calls for a food processor or blender. I usually use an immersion blender but I really prefer the food mill. The texture of the purée through the food mill is denser, not airy and whipped perfectly smooth. Put spoonfuls of soup mixture, both solids and liquid, into the mill set over another soup pot, turn handle clockwise and every so often counter clockwise. It’s very easy. I just like the texture and flavor better, but that said, it’s still very good no matter how you choose to purée it. 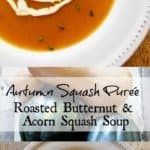 Butternut squash and acorn squash are the two varieties used in this soup. They are baked in the oven with carrots, onions and chicken stock until very tender. The flesh gets scooped out and it all goes into a pot along with the cooked vegetables and stock. Some seasoning and more stock and then it’s time to purée. Such incredible, rich flavor. I’m not going to lecture about using homemade stock. But if you can, please use that or a good quality canned chicken stock. I had just the right amount in my freezer, time to make more stock. Also, the recipe calls for mace. I’ve never used mace and always just omit it. This time however, I substituted allspice. You can substitute allspice or nutmeg for mace (which is really expensive and you’ll probably never use again). I really like the addition of this spice, better than when I left it out. Definitely garnish this soup with fresh snipped chives, so good. Of course I didn’t have crème fraiche, so I used a drizzle of heavy cream and tossed on a few pumpkin seeds ~ the perfect garnish for this soup. I remember way back as a teenager and in my early twenties, this would not be something I would have liked. But tastes change and when you love to cook, well you find you like a lot of things you never tried before. I’m hoping this autumn squash purée will appeal to my children eventually, and to you, too. Did you hear me girls? You might also like a bowl of these other soups to warm up to in the cool weather ~ Irish Beer Cheese Soup, Potato Leek Soup and Sweet-and-Sour Beef Cabbage Soup. If you’ve tried this Autumn Squash Purée, please rate it below in the comments and let me know how it went ~ I love hearing from you! HUNGRY FOR MORE? Subscribe to my Newsletter and come hang out with me on PINTEREST, INSTAGRAM and FACEBOOK for all the latest updates. 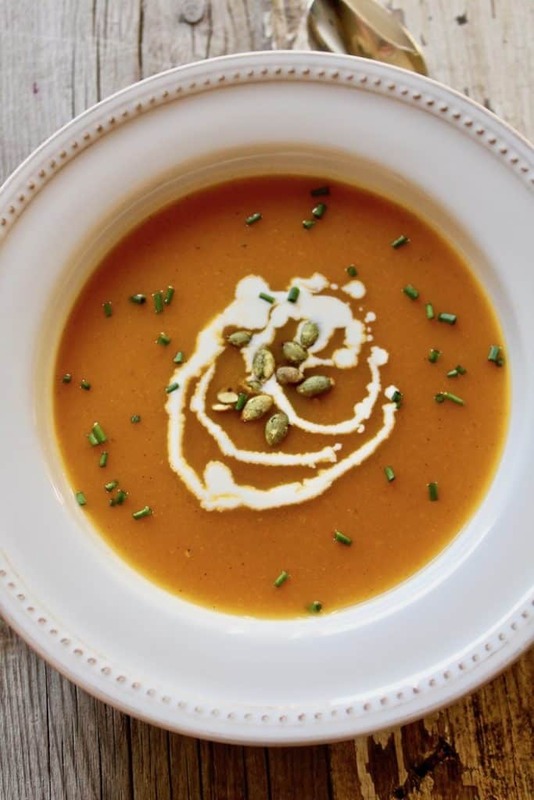 Roasted butternut and acorn squash soup, a warm and comforting purée for the cool weather months. Place the squash halves skin side down in a large roasting pan. Place a pat of butter (about ½ tablespoon) and 1 teaspoon brown sugar in the cavity of each. Arrange the carrots and onion slices around the squash. Pour 2 cups of chicken stock in the pan. Cover tightly with aluminum foil and bake for 2 hours. Allow vegetables to cool slightly, and then scoop out the squash flesh and put in a soup pot. Add the carrots, onions and cooking liquid. Add the remaining 8 cups chicken stock, mace, ginger, cayenne and salt. Bring to a boil and then reduce heat and simmer for 10 minutes. Purée the soup in batches and return it to the soup pot. (Use a blender, food processor, immersion blender or food mill.) Adjust seasonings and heat through. If you use a food mill, don't forget to scrape the bottom of the mill, lots of good stuff there. Serve the purée garnished with snipped chives and a dollop of crème fraiche, sour cream or drizzle of heavy cream. I like to garnish with pumpkin seeds also. The immersion blender is the easiest, but the food mill is probably how I've made it most, I just really like the texture. *Adapted from The New Basics Cookbook. Squash Purée… quite tasty and a fine example of tautology.